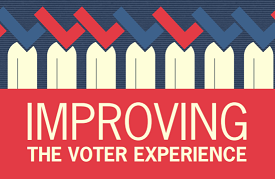 How do long lines at polling places affect the experience of the average voter? According to a new study, published by the Bipartisan Policy Center, long lines on election day can undermine the voting experience and even discourage people from voting. Stephen Pettigrew, the Associate Director of Data Sciences for PORES and the Deputy Executive Director of the Fox Leadership Program at Penn, coauthored the new study and found that precincts hampered by long lines at the beginning of an election day would face longer lines all day long. The study, which analyzed lines from 4,200 precincts across the country, found that the number of voters who waited more than 30 minutes to vote fell between the 2012 presidential election and 2016 presidential election. In fact, the states that had the longest lines in 2012 saw the biggest improvements in 2016.